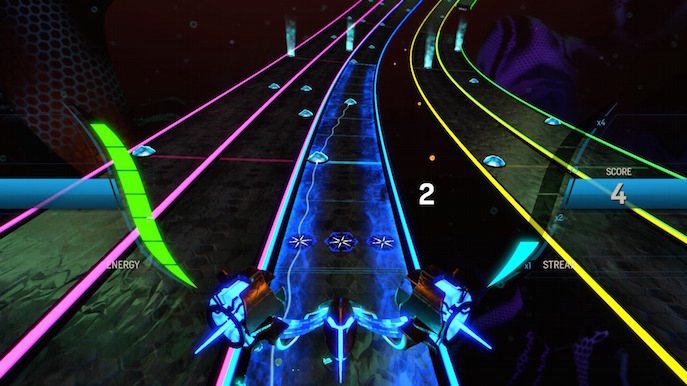 After a successful kickstarter campaign, the controller-based rhythm action game, Amplitude, a game developed by the guys behind the PlayStation 2’s original, beats its way on to the PS3 and PS4. The game offers high fidelity visuals, new composed music, and quite a few shenanigans that might make some music enthusiasts and audiophiles cringe a bit. The story tells how a woman goes into treatment in the Amplitude OS, going through quite a bit of emotions, memories other factors that you are here to help fix! WHAT SORT OF GAME IS THIS THOUGH? In this game the music track is divided by literally tracks, each being composed of the song’s stems (well, I’ll name them like that in this case). For example, you will be able to plane across the Drums, Bass, Synth, Vocals stems to effectively press the upcoming nodes for each. The fun thing about this incentive, is that you can start and mix the sound differently, you can even start it however you like as you can choose which track to do first. After doing a few number of nodes on a track this one will get destroyed and force you to go to another one, when performing successful notes the music will play instruments (or vocals) from those specific tracks, nice eh? Fortunately, the stems cross-fade somewhat decently (a bit forced but they do), if this wasn’t the case the song would sound very robotic, but at least there is some sense of the essence of the whole song going on. Of course like most rhythm games, the ship needs energy and if you miss many consecutive notes you will game over and have to retry or choose a different song, on the other hand, get many successful hits and reach many streaks to obtain a high score. 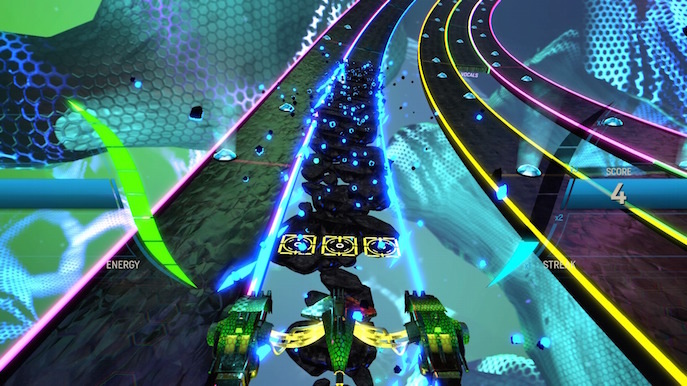 The game offers 4 player local co-op, allowing for users to play a track all the way to the end to see who got the highest score. Nothing to new, but it’s always a nice feature for players that aren’t as “skilled” so they don’t get a game over. It’s mostly a game about the BPM, concentration and enjoying the music. The general thematic for the entire soundtrack is very electronic, nothing out of the ordinary stands out. Freezepop, Danny B, Jim Guthrie, are some of the composers in this game, offering more than 20 tracks to play. This amount of songs for the price of the game seems like quite the deal, seeing as some other music games have AAA pricing and have less than half this number of tracks. The game has leaderboards, because why wouldn’t you brag about getting high scores to other people? OK, BUT WHAT’S THE ISSUE? The thing about this “liberty” in gameplay, is that it makes the song sound incomplete and inconsistent, if you jump across similar tracks the song will simply forget about some instruments and will sound very generic. Also, you would think the game makes you build yourself up to make the song awesome, but once you get to the vocals track, its like the singer went “OH! It’s my turn, yeah!”, that sounds terrible. This sort of gameplay also screws up with the whole balance mix, making some instruments -that shouldn’t stand up that much- overwhelm the ones that need it. However if you don’t mind this much, in general terms the game functions quite well; tracks make you cross in search of power nodes to keep your streak up, but sometimes the game places a node almost impossible to get before the next power node, so getting 100% on a song can be quite challenging. The game truly has an interesting learning curve, but I would believe most of its user-base knows already the basic mechanics; knowing that this game is from Harmonix, hence, having knowledge of Guitar Hero and Rock Band. If that is not the case, the game has a quick and simple tutorial at the beginning; again, it’s a very straightforward game. 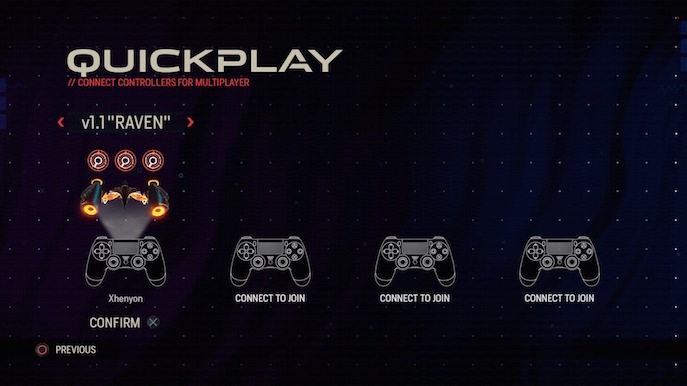 Like I mentioned before, one of the things I liked mostly are how unique and well designed the 4 playable ships are, making 4 player co-op an even more interesting experience. 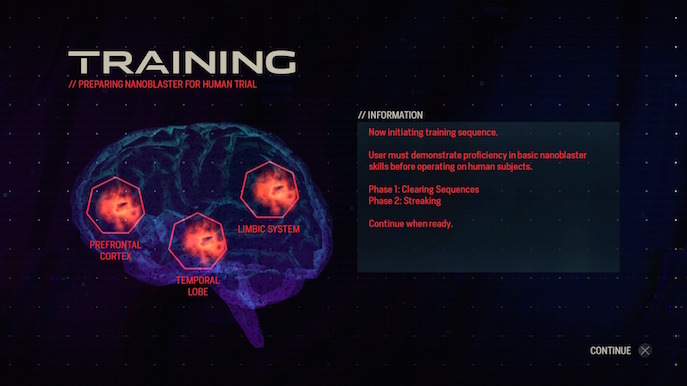 The game enrolls a high fidelity visual with neon lightning, special sci-fi effects and all at a stable framerate. 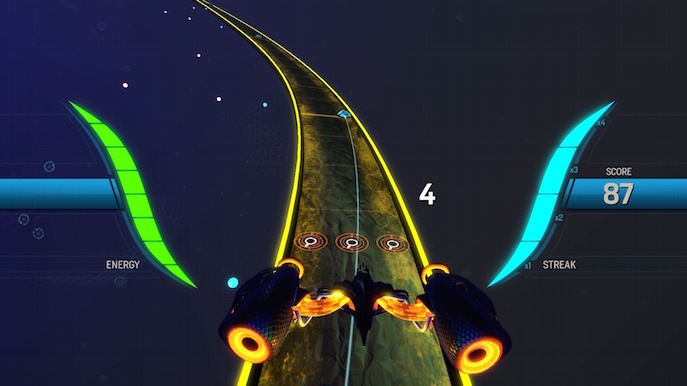 The aesthetic does remind of similar games like Audiosurf and Laserlife. Not much more to mention, other than recommending this title to gamers that like rhythm games and are not very music-mixing picky. 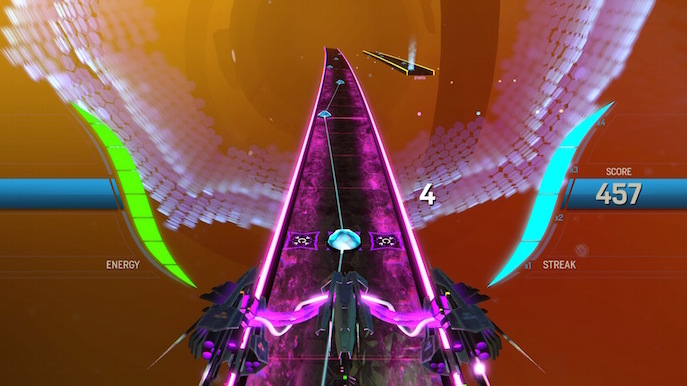 The whole visuals and dynamic of the game are very enjoyable and rewarding once you begin to finish songs at higher difficulties. While learning the game at first can seem difficult, it’s a ride that can truly become a high beat.